Madison Clarke of <?xml:namespace prefix = st1 ns = "urn:schemas-microsoft-com:office:smarttags" />Phoenix continued her winning ways in May, capturing the Girls 12 title at the Roxy Junior Championships, a level 3 national tournament, in Palm Springs, Calif. The No. 1-seed dropped only one game during her first two matches en route to a quarterfinals showdown with five-seed Maia Magill of Studio City, Calif., which she comfortably won, 6-2, 6-2. Clarke then rolled over No. 4-seed Ryan Peus of Santa Barbara, Calif., 6-1, 6-0. 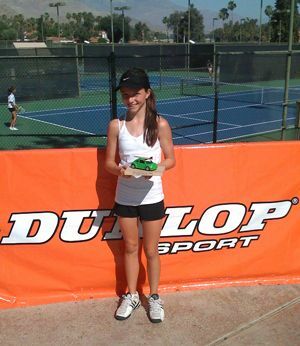 She again made easy work in the finals, dropping unseeded Parris Todd of Ladera Ranch, Calif., 6-1, 6-0.